→DIY How To Make LED Tail Light? LED tail lights are the best choice if you are planning for a style upgrade of your car or any vehicle. If you are a car lover, your mind will always look for ways to make it attractive and sporty. You will take ideas from TV commercials, movies or even from your close ones about the ways to upgrade the beauty of the car. Along with the beauty, LED tail lights come with various advantages which can add value to your vehicle. Installing it will save your money as LED consumes less energy and are efficient to use. These have longer life spans so the brightness and the uniqueness of your car will last for a more extended period. Interestingly, having LED tail lights in your car can even increase the price of the car if you are up for selling it. Since buying LED tail lights will be expensive if you have a low budget, it is better to know how to build one. Knowing the proper steps will help you achieve it. 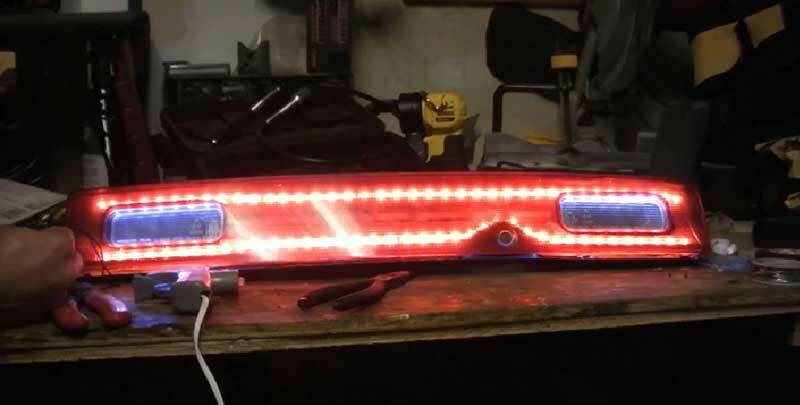 Following are some ways that you can use to make LED tail lights. Start by removing the plastic covering of the tail light carefully from your vehicle. Do not rush while removing it. Use a screwdriver to unscrew the used tail lights and remove them carefully without harming any wire connections. Do not break the lights during the process. Put the used lights in the oven and heat them. Do not overheat as it will crack the glass. Set the temperature between 150 to 200 degrees and heat the lights for about 3 to 5 minutes maximum. The heat will soften up the sealant. This is an excellent time to use a knife for cutting out the sealants and opening up the lens of the light. Cut in a way where the connections are present. These are perfect for molding, and it can be transformed into any shape by giving specific temperatures to it. You can use ABS plastic as it is highly recommended for this purpose. Use a heat gun and mold the plastic to form a plate where LED lights will be inserted. The shape should be similar to the current pattern where the used taillights were fitted. Do not use a hair dryer for heating as the temperature is shallow in this device. The plastic needs to be heated at a certain degree, so a heat gun is the best choice. After molding, color the plate if you are interested in different customization. Drill the plates evenly. Make sure the drilling is clear for the LEDs to insert correctly. The pattern should follow similarly for every rows and column. When you are drilling, hold the plates properly. If possible, use a clamp to attach the plates and then drill accordingly. Use super glue for this process. Apply it to every LED light and insert it carefully to every drilled hole. Buy a branded paste as this process is very crucial. After inserting, wait for a couple of minutes and give it some time to dry. Check the LEDs whether they are tightly attached or not. Insert the resistors to the holes closer to the LEDs. These lights have two sides; a positive, and a negative one. The positive side is the one having a long end. So, it will be easier to detect the sides according to the length of the ends. Take one end of the resistor and solder it to the positive side of the LED. Use a good soldering iron tool to make good connections between both metals. Follow this process for every LED. Do it precisely and safely. If the wiring is wrong, some of the lights will not lighten up. It is better to check the wire colors present in your car. Wrap the wires correctly to the tail lights. Make sure the wrapping is done tightly so that the plastic plates do not shift from its original place. Fit the lights and plates in the car properly. Do the screwing where it is needed. Apply a liquid or a spray sealer to seal the place properly. Do it steadily and avoid putting too much pressure on the sealant as it will be in excess. If it happens, remove the excess sealer with a brush or any other wiping tools. After that, leave it for about 2 to 3 hours maximum. Now that you are finished with the tough part, it's time to check the performance. Check the intensity of the lights. If the performance is desirable, you are done with your project. If the lights are dimmer, check the wiring connection. The brightness of the lights can be changed by choosing different resistors. Resistors come with different values. If you buy a low value one, the intensity will be good. This resistor will let more current to flow in the circuit which will increase the overall brightness. The opposite will happen if you buy a high-value resistor. So, buy a resistor according to your requirement. Use a sealant for finishing the project. If you are having a problem with the overall connection, you can melt the sealants by heating it to a certain degree. After that, you can work on the problem. Always wear goggles when you are soldering the metals because soldering creates sparks which might damage your eyes. Wear protective gloves when you are cutting the sealants. Also, use it while doing the wiring connection just to be on the safer side. The steps mentioned are convenient if appropriately applied. If you are new in this project, do not hesitate while starting. Your confidence will develop with time. For experienced workers, this job will be finished quite easily and early. After reading the article, you will be one step away to make your customization vision come true.